Crimping RJ-45 connectors onto CAT-6 cable can be particularly frustrating, because CAT-6 is quite a bit thicker than CAT-5 cable. Here are some techniques to make the process of installing RJ-45 connectors easier. frustration can turn into feelings of defeat. Having recently installed more CAT-6 cable than I care to think about, I've found some techniques to make the process of installing RJ-45 connectors easier. Lesson one: Not all RJ-45 connectors are created equally. One reason why CAT-6 cable is much harder to work with than CAT-5 cable is that CAT-6 is quite a bit thicker. So it's hard to get RJ-45 connectors intended for CAT-5 cable to attach properly to CAT-6 cable. When you're shopping for RJ-45 connectors, make sure the ones you buy are suitable for CAT-6. The picture below shows a CAT-5 and a CAT-6 connector the CAT-6 connector is the darker one). 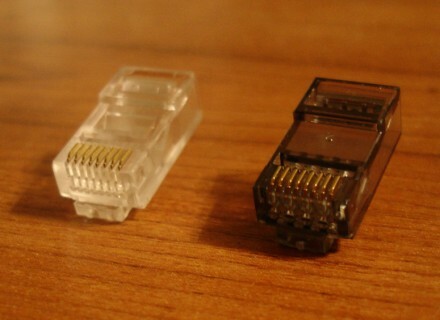 RJ-45 connectors intended for use with CAT-6 cable are larger than their CAT-5 counterparts. But even with the correct types of connectors, working with CAT-6 cable can be tough. Still, you can make the process easier. Begin by stripping the outer covering from the end of the cable. Remove about an inch of covering. Eventually you'll have to cut down the amount of exposed cable, but the process of installing the RJ-45 connector will be easier if you have plenty of exposed cable to work with (but not too much). Once you remove the outer cover, you'll see that some of the pairs of wire are twisted together (hence the name twisted-pair cable). Untwist these wires. Once all the wires have been separated, pull them backward, as shown below, so you can cut off the exposed plastic core, as shown below. Remove as much of this core as you can. Be careful not to accidentally cut the wires in the process. Now that the core has been removed, your next task is to straighten the wires that were previously twisted. The easiest way to do this is by using two pairs of tweezers. Use one set of tweezers to firmly hold the wire just beneath a bend, and the other pair to straighten the bend. The wires don't have to be perfectly straight, but the straighter they are, the easier your job will be. Since the leftmost wire is the orange with the white stripe, there's a natural tendency to start with this wire on the left. Although it's possible to get the wires in the correct order using this technique, getting the wires to stay in order when you insert the RJ-45 connector becomes very difficult. Rather than starting with the orange and white wire, lining up the wires is a lot easier if you start with the green wire with the white stripe, and then work on lining up the blue, blue and white, and green wires. When all is said and done, the wires will still have to be in the correct order, but starting with the green and white wire forces you to turn the cable a different direction than if you were initially working with the orange and white wire. This seems to make all the difference in the world for getting the wires lined up in a way that facilitates easy installation of the RJ-45 connector. 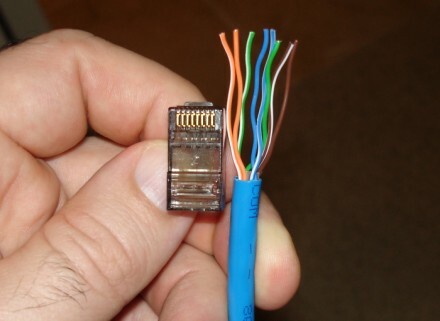 Now that the wires are in the correct order, hold the RJ-45 connector next to the cable, as shown below, to determine how much wire needs to be cut off, as shown below. You'll want to make the cut so that the ends of the wires line up evenly. The proper length can be determined by looking at the cable's outer insulation. The insulation should stop just inside of the RJ-45 connector. It's better to make a series of small cuts to determine the appropriate cable length than to try to get it exactly right on the first cut. Test-fit the RJ-45 connector between each cut. If you try to get the length exactly right on the first cut, you risk cutting the wires too short. The easiest way to slide the RJ-45 connector onto the cable is to use your thumb to apply pressure to the cable in the spot where the wires are first exposed from beneath the insulation. This will help keep the wires in order. 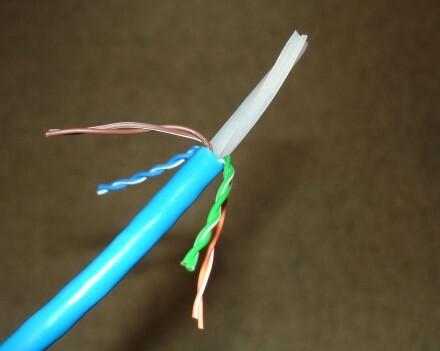 When the cable is finally cut to the correct length, you should check a few things before crimping the cable. 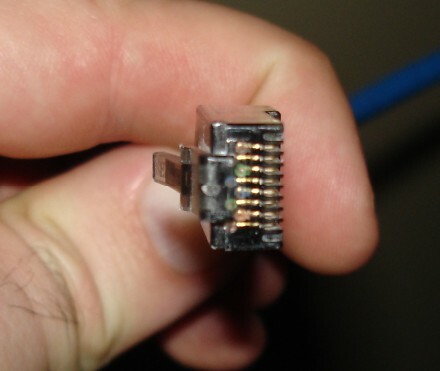 First, make sure the wires go all the way to the end of the RJ-45 connector, as shown below. The easiest way to do this is to look at the end of the connector and make sure you see copper in each wire slot. This is difficult to photograph, the figure below shows that the wire goes all the way to the end of the connector. You should also verify that the wires are still in the correct order. It's easy for the wires to get out of order when installing the cable end. A quick check at this point will keep you from having to cut the cable end off and starting over later. Assuming the wires are in order, you can go ahead and crimp the cable. When you've finished crimping both cable ends, you can use a cable tester to verify that the ends were installed correctly. About the author: Brien M. Posey, MCSE, is a Microsoft Most Valuable Professional for his work with Windows 2000 Server, Exchange Server and IIS. He has served as CIO for a nationwide chain of hospitals and was once in charge of IT security for Fort Knox. He writes regularly for SearchWinComputing.com and other TechTarget sites. RSS: Sign up for our RSS feed to receive expert advice every day.